Mania 3-pc. Table Set The Mania 3-piece table set features veneer shelf and solid wood legs along with gunmetal-finished tubular metal tops and shelf frames, topped off with clear beveled tempered-glass tabletops to create an exciting contemporary design that is sure to enhance any living area. The Mania 3-piece table set features veneer shelf and solid wood legs along with gunmetal-finished tubular metal tops and shelf frames, topped off with clear beveled tempered-glass tabletops to create an exciting contemporary design that is sure to enhance any living area. L: 34" x W: 34" x H: 19"
L: 22" x W: 22" x H: 24"
These three modern tables were a complete surprise for the price. Sturdy, attractive and a match with any furniture style. Definitely a low price for high value. Just moved from out of state and shopping for furniture is fun but can be a exhausting at times. Stopped in to pickup a piece of furniture that a friend ordered and saw this 3 piece set and fell in love. Beautiful and goes well with my other furniture. Love the design and the price. I recently purchase this set to go into my living/dining room combo. It was easy to set-up and looks great. A great size and for the price, Im not sure you can find a better value. Sturdy and durable ! Enjoy. These tables are very easy to set up, easy instructions and they look great. 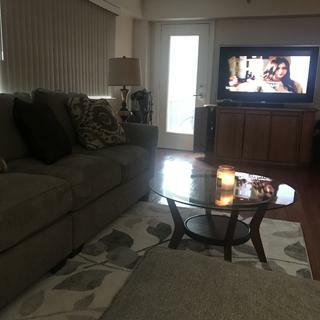 I've been looking for these tables for months , my living room is not that big so they are perfect size and I couldn't believe I found them here and for a such a great price. This is perfect for a smaller area. The glass makes the room look larger. Nice set! Love the way it looked with my sofa, very happy for the choice! Very pleased customer, thank you! My entire living room set minus the carpet I purchased from Raymour Flanigan thank you all! Are the legs of the tables more of a dark cherry or dark mohogany (brownish) finish? BEST ANSWER: The legs might be described as more of a dark cherry than a mahogany. My dog chew my leg. On my coffee table can I order a replacement part? BEST ANSWER: For assistance with hardware replacement, please contact our customer care department at 866-383-4484, option 7. We would be happy to assist you! BEST ANSWER: Absolutely! The Layaway program requires 20% down and you can take six months to pay. For assistance with a Layaway purchase, please contact Online Sales at 866-383-4484, option 3. BEST ANSWER: With solid wood legs and tempered glass the Mania tables are very sturdy.